This chapter examines how experiences in a course for elementary education teacher candidates supported their technological pedagogical content knowledge (TPACK). Based on data from teacher candidates and school partners, the author modified course activities and collected data to inform the course. Data analyses indicated that the course refinements positively influenced candidates' development of aspects of TPACK, specifically TPK, PCK, and TPACK. Candidates reported in both iterations of the study that technology was being used in classrooms in ways that did not match what they were learning in courses. Implications include the need to reconcile the divide between research-based instances of technology integration and the actual use of technology in schools in the context of TPACK. The seminal writers of technological pedagogical content knowledge ([TPACK]; Mishra & Koehler, 2006; Niess, 2005) conceptualized TPACK as an extension of Schulman’s (1987) pedagogical content knowledge framework with technology as a dimension that can overlap with knowledge related to pedagogy and content. 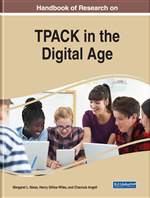 Since the original conception the idea of TPACK-in-action or the application of TPACK-in-practice has developed to provide a more operational and tangible idea of what TPACK looks like in practice (Polly, 2015; Bibi & Khan, 2017). Practice-Based Teacher Education: Teacher education approaches that involve the analysis and practice of high-leverage teaching pedagogies. Blended Learning: Learning environments that include a blend between interaction with teachers and learning experiences on devices such as laptops, iPads, or computers. Personalized Learning: Learning environments in which individual students or groups of students have personalized required and optional assignments based on data. Teacher Candidates: Individuals who are currently enrolled in a formal educator preparation program earning their initial teaching license. Technological Pedagogical Content Knowledge (TPACK): Construct representing knowledge related to effectively teaching with technology. Elementary Education Teacher Education Program: A teacher education program preparing candidates to teach children ranging from Kindergarten through Grade 6.